Thank you, Crown Books for Young Readers!!! Sometimes a story will just get under your skin and tug at your heart. Sometimes you won’t even see it coming. That’s what happened with Mr. 60%. First, let me say I love this title. It’s unique, memorable and it has an important meaning to the story, which always makes me happy. A title that has a clear connection to the story is one of my favorite things ever! 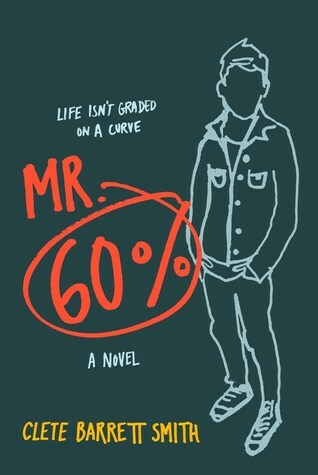 When I started reading Mr. 60%, I was immediately hit by a sense of familiarity. I’ve recently finished another YA book that had a teen drug dealer and an overweight girl as the two main characters, Trust by Kylie Scott. Soon enough, though, I learned these two books were worlds apart. They were both great, but the tone and narrative were completely different. While Trust is a clear romance-focused book, Mr. 60%’s message is more about dealing with loss, finding hope and surrounding yourself with good people. And, dude, this book is filled with genuinely good people as characters. The school counselor, Mr. Marsh, for example, is a good, good man. I wish there were more people like him in the world. More people like him working at schools all over the world. The way he didn’t push, but was still there for Matt was brilliant. He’s a clear example of a person who isn’t willing to give up because he wants to make a difference, and he knows how to make a difference. People often get themselves lost in their need to help because they don’t know what to do, but I believe there are many folks out there that are level-headed like Mr. Marsh, and those are the people who should be around teenagers and helping them find their way. Mr. Marsh was a side character, but the amount of love and appreciation I have for him isn’t small at all. I think I only loved him less than I did Amanda, because there’s no competing with that girl. Amanda will be a phenomenal nurse one day—and yes, I’m talking about her as if she was a real person. Deal with it. I absolutely loved how good and pure and genuine and pretty much perfect she was. She didn’t have anything to gain by helping. There were no promises. No guarantees. She simply did because she wanted to and because she saw someone in need of help. I loved how easy it was for her to fit into Matt and Jack’s life, as if she belonged. And she did. It was all so cohesive and easy and warm. THE FEELS! Now to Matt and Uncle Jack. Man. The tears. The freaking tears. I have to say that one of my favorite things about this was how these two characters were flawed, but they still charmed me and made me feel so much for them. Uncle Jack wasn’t this perfect father figure, but he was still a father to Matt. A good father and a good uncle and a good man, even though it was implied he’d done some shady things in the past. Same for Matt. He was a freaking drug dealer, so he was far from a conventional good guy. He broke the law left and right, and I’m not even sure if it was all because of his uncle’s situation or if he would’ve gone down that path anyway. But Matt was a lost kid who’d gotten the short end of the stick when it came to life in general, and it seemed like Mr. 60% only needed a little bit of light (Amanda) and guidance (Mr. Marsh) to find a way out of that hole. While Matt did questionable things, I still wanted to hug him. I wanted to be Amanda’s mom and hug him real tight because he gave me something I need when I read books. He gave me the kind of priceless dynamic I want to see in every story when it came to his relationship with his uncle. I want to see characters who care about each other even when they’re not throwing I love yous around. People who’ll care for each other and be there when needed. People who’ll sacrifice and hurt and make me cry. I’m not a crier, but this book reduced me to a crying mess. I should’ve known better to read the final chapters on the bus. So while this was a quiet read with no romance (yeah, sorry, but Amanda and Matt are perfectly platonic—yeah, I said perfect, and I’m the biggest romance fan ever), it gave me more than I needed. More than I expected when I started reading. It gave me hope that somewhere out there “Amandas” and “Mr. Marshs” will find their “Matts” and help them out of the dark.